Last night was the final night of preliminary competition. Sue Ann Forrest wore a stunning green evening gown and answered her onstage question about how women need a good role model. The judges use numbers to say how many points they received for each part of the competition and by tonight, for the final, all the numbers will be added up and the top ten will be revealed. The top ten then go to compete in evening gown, talent, and swimsuit/fitness again and the judges will score them based only on tonight’s performance. Wednesday June 22 was the first night of the preliminary competitions for the girls to compete to see who will be the next Miss North Carolina. The ladies are divided into three different groups and each group does a different element of the competition each night. on Wednesday, here is what the Campbell students did. In addition to these three, there is also a Campbell graduate student, Brittany Thorton. Sue Ann was one of the fittest in her group while Sami wore a green dress that shone as bright as the Emerald City. Scarlett wore a dress that lived up to her name. She wore a stunning red dress with red earrings. Come out to the Jam Session, hosted by CAB, in the Wallace Student Center on March 17th, 2016 at 8pm. Xzavier Williams, a returning participant of the Jam Sessions believes, “ the overall talent that comes out is very good and it is a lot of fun to watch the talent. It is also a lot of fun to meet new people and hang out with friends.” Xzavier loves to sing, and perform songs that he has written himself. If you enjoy singing or even just playing an instrument this is a great event to network and socialize with other talented students. Below: Xzavier Williams performing his songs. Want the opportunity to get involved in a meaningful and rewarding service activity? Strickland Hall is sponsoring a service project through Sole Hope, an organization that strives to provide children in Uganda with shoes to protect their feet from harmful diseases. The shoes are created from denim jean material, and the organization recruits the help of willing volunteers to collect the jeans and cut them into shoe patterns. From March 20th through April 2nd, we will be holding a campus-wide jean drive, and we need YOUR help! As everyone begins to clean out their closets before heading home for the summer, we hope you’ll consider donating your old jeans – even one pair makes a huge impact! Drop-off locations will be in all residence hall lobbies, as well as in Lundy-Fetterman, the Campus Ministry House, and the Wallace Student Center (the Oasis). The “Shoe Cutting Party” event, where we will get together to cut the jeans and package them for shipment to Sole Hope, will be held on Monday, April 25th at 8:00 PM in the Rumley Center. If you are interested in helping with the project, please contact Anna Marie Vagnozzi, Strickland Hall RA, at a_vagnozzi0927@email.campbell.edu for more information. Want to learn more about Sole Hope? Visit www.solehope.org. Thanks for your participation in this awesome service project! Flipping through old yearbooks from previous classes, it’s amazing to see how much Campbell University has changed just in the past few years. But given all of the new change in landscape, buildings, and academic programs, some things at Campbell will always remain the same. Campbell is home to many yearly traditions, including the annual Spring Fling. This Thursday we are taking you back to Campbell’s Spring Fling in 1996. 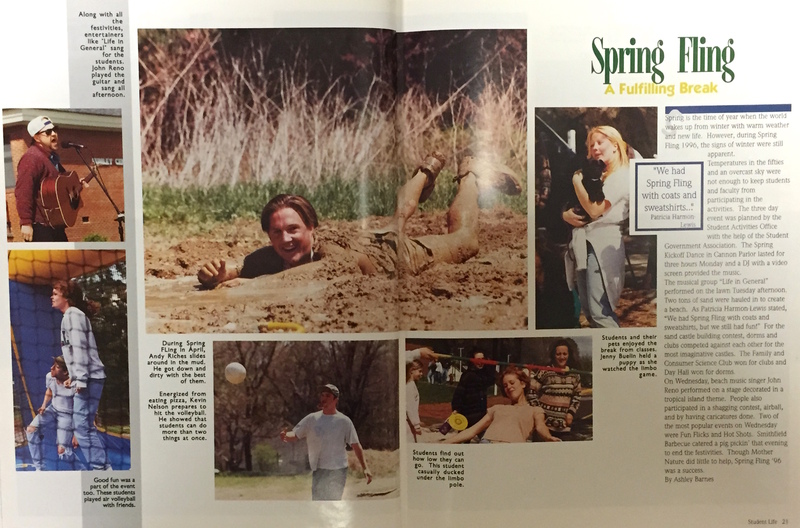 So what was going on around campus during Spring Fling 19 years ago? Campbell students enjoyed several events similar to the ones hosted this week by the Campus Activities Board (CAB). Unlike Spring Fling this year, in 1996 Spring Fling was only a 3-day event. To kick things off for Spring Fling 1996, the Student Activities Office hosted the “Spring Kickoff Dance” in Cannon Parlor. Students also engaged in many outdoor activities ranging from volleyball to limbo. One afternoon, students gathered around to listen to the group “Life in General” which performed outside in front of Rumley Center. Despite hauling-in 2 tons of sand to create a makeshift beach, “the signs of winter were still apparent” with overcast skies and low temperatures. But students did not let the cooler weather have an ill effect on their Spring Fling festivities. Coming back to Spring Fling in 2015, students have already been participating in various outdoor activities. So far, students have participated in a fun game of Rock-n-Roll on Monday, tie-dying shirts on Tuesday, and a “State Fair Festival” at Saylor Park on Wednesday. The week of fun will come to an end on Saturday after students dress up for a night of fun in Garner for the “Spring Formal.” Fortunately for us, with warmer temperatures and sunny days, we are having a little more cooperation from Mother Nature. Many things have happened over spring break. From the Big South Tournament to the CAB trip, spring break is an exciting time that means we are getting closer to another school year being over. Many students went to Myrtle Beach for spring break to participate in the Big South Tournament, to attend the game, and to enjoy the beach. While the sea, fog, and wind may have been a setback for enjoying the beach, it was an exciting time at Coastal Carolina where the tournament was held. The men’s basketball team had a good game on Wednesday, March 4, but lost to Garner Webb. The women, however, won their game on Thursday and went on to the semi-finals. The students who went on the cruise with CAB had an excellent time enjoying the weather of the tropics. 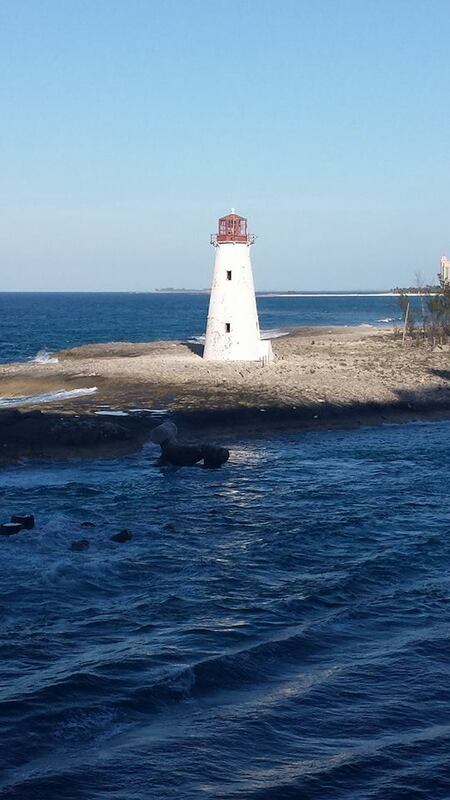 They were supposed to go to four ports: Nassau, Cozumel, Costa Maya, and Roatan. However, the waves were too high for their boat to dock in Roatan and they only went to the other three ports, but who can complain with an otherwise excellent cruise in warm weather?! For the Pine Burr staff, spring break was an exciting time when the last pages of this year’s yearbook was sent off to be printed. We are excited to announce that our book will be ready for students to pick up in April and more details will be coming up as it gets closer. I hope everyone had a wonderful, relaxing spring break and is ready to enjoy the last two months here at Campbell for the 2014-2015 year. Saturday March 14: Pi-K at 8:30 in the Lundy Parking Lot, Lacrosse game at 1, Medieval Games at 3 in Academic Circle, and a baseball game at 4.